Bali Waterfalls – Bali is notorious for its party scene, its boozy beachfront bars, and its crazy waves that call on surfers from all over the world to hike over with their surfboards, wetsuits and all that jazz to experience a destination so lively and thriving, its energy can be felt everywhere. 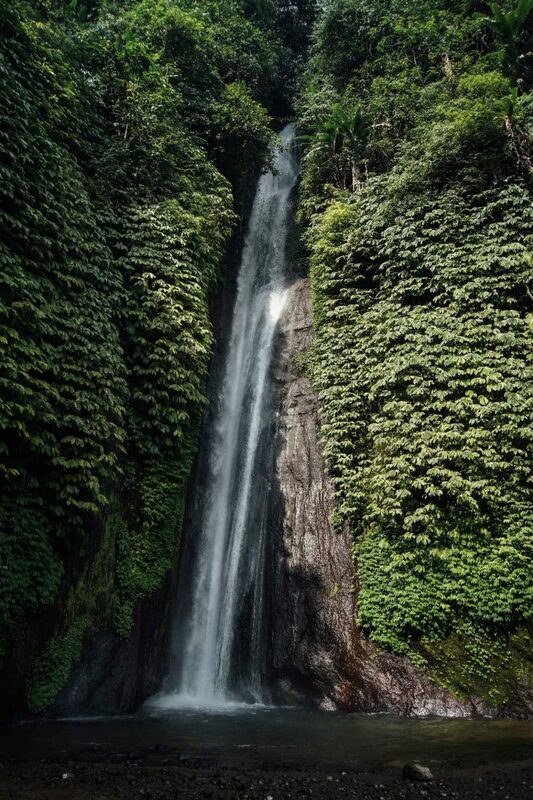 However, above all of this, did you know that Bali is home to some of the world’s most mystical waterfalls? Come to think of it, on a tropical island as stunning as Bali, whose luscious rice paddy fields in Tegallalang and evergreen rainforests in Ubud should already hint to the natural wonders the island could offer, it’s very easy to imagine the beauty of some of the hidden gems deep inside the land should one choose to venture out and find it. There are actually a number of beautiful waterfalls, most of which are even swimmable, throughout Bali that can be visited within a day. Most, however, are not located within the main touristy areas of Kuta, Legian, Seminyak or Canggu and will need to be accessed via a moped scooter, a rented car, or, the easiest method, a taxi. 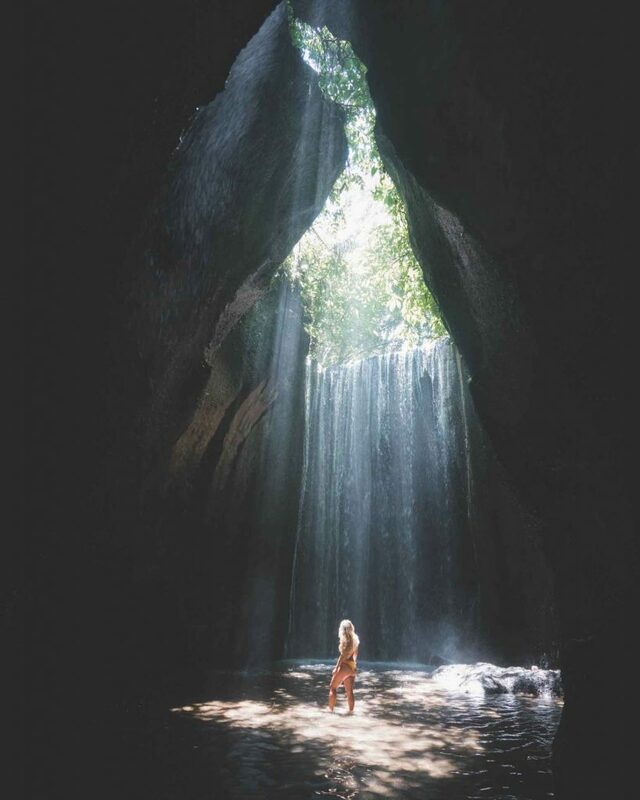 Below we’ve chosen some of the most stunning waterfalls in all of Bali that are all worth the trek to get to, so if you’re planning your itinerary for Bali soon, remember to include a few of these on the list! 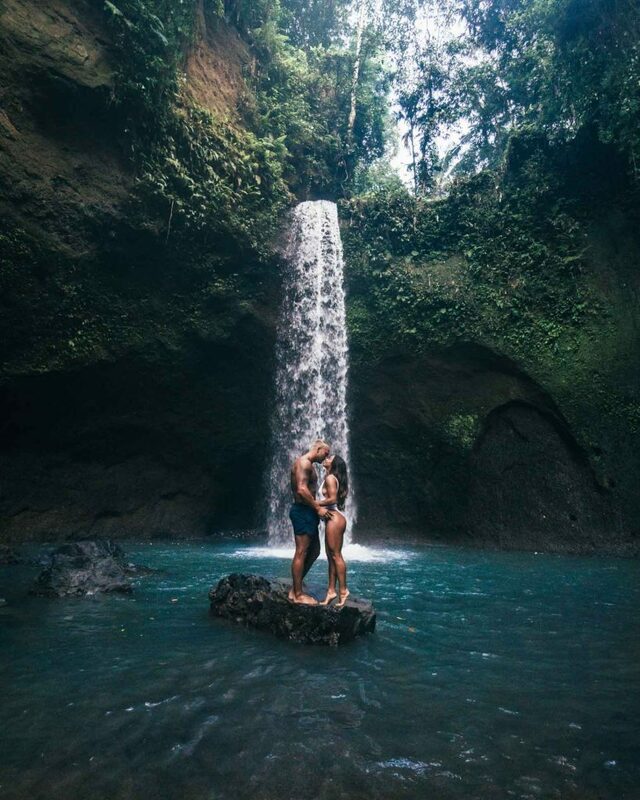 Considered one of the most beautiful waterfalls in Bali, it’s also known as Bali’s best kept secret, as it’s not overrun by tourists just yet. Surrounded by luscious vegetation that spiral their way up the cliffs, exotic birds and seasonal butterflies, this waterfall is one you’ll likely never forget. The water falls into a shallow pool, and the crash of water against the surface can be heard from miles away. During high season, the waterfall actually splits into two deposit columns due to the sheer amount of water flowing through. In the early hours of the morning, the mist produce by the water spray floating through the first rays of sunlight shining through the trees is pure magic. 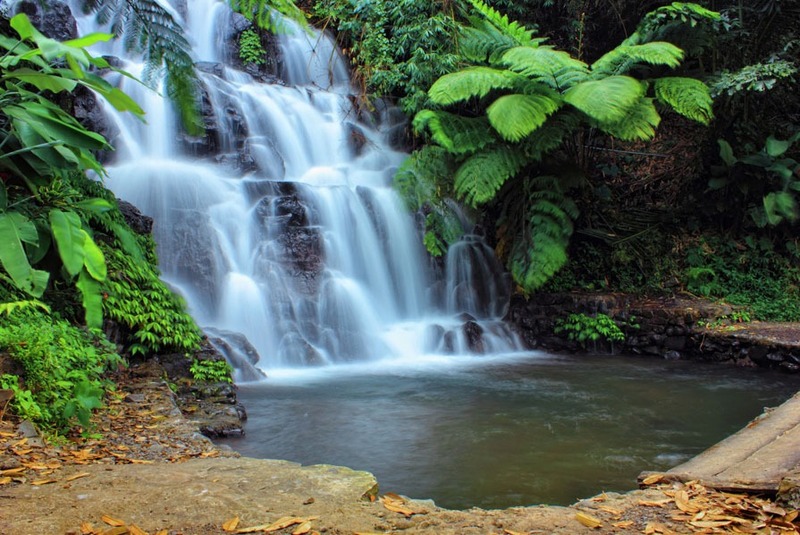 It’s an absolutely stunning place to take some photos and showcase the true beauty of Balinese waterfalls. Access: From Ubud, the drive to Tibumana waterfall is around 30 minutes. Once you arrive in the parking lot, head to the left of the temple and you will need to pay the entrance fee at the shack. Follow the subsequent winding path of stairs. Located conveniently in the forests of Ubud, Tegenungan is surrounded by lush flora and fresh jungle air, making the gorgeous waterfall that tad more special. Strong water currents and a wide and deep (enough) pool makes it the perfect place for you to have a leisurely swim deep into the afternoon. Due to its location, it makes for the perfect destination if you’re planning a day trip to Ubud and want to end the day floating in cool water, surrounded by nothing but silence and fresh air. Try to avoid the middle of the day, as it does get pretty crowded, being one of Ubud’s most popular waterfall attractions. 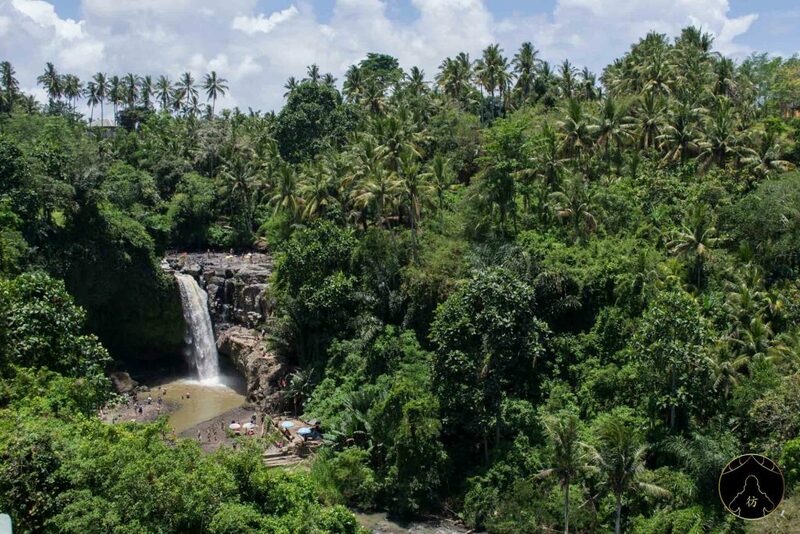 Access: It is located just 10km outside from Ubud, so driving a motorbike or car will only take you maybe 10-15 minutes. Once you arrive, you’ll see signs for ‘Tegenungan waterfall’ and it will point you in the right direction. If you’re driving, parking in the designated parking lot will cost you 5,000 Rupiah. This one is an absolute favourite for the ones who still have a little bit of a child’s adventure spirit in them. Trek here and be rewarded with a natural slippery dip that you can slide down right into a pool of crystal-clear cool water! Known as the ‘slip-slide’ fall, it isn’t a towering monstrosity, but rather a waterfall where visitors can climb to the top of the cliff and slide their way down to the bottom, the distance of which is about 35m. The climb to get to Aling-Aling is quite strenuous. Once you park the car at the designated parking lot of the waterfall, you will need to journey through rice fields and up and down hundreds of steps for about 400m before you actually reach the waterfall. However, the lack of crowds, relaxing atmosphere, cool water and splendid views are well worth the trek. Access: From Denpasar, take the major road towards Singaraja. Before entering the area, there will be a big fork in the road. Take the right and follow the direction towards Sukasada station. Continue along that road until you see a second fork in front of Sambangan village where you will see a sign for Aling-Aling waterfall. Head in that direction for about 2km and you will arrive. From Denpasar, you will need to travel at least 80-100km. Git Git waterfall is quite possibly Bali’s most popular waterfall, being a current mainstream attraction, highly accessible, and outrageously stunning all at the same time. It’s such a well-known destination that, in fact, it’s been set up as a mini tourist area, complete with arts shops and small cafes to cater for the number of people visiting it. Access: From Denpasar, you will need to drive 2.5 hours to get to Git Git. 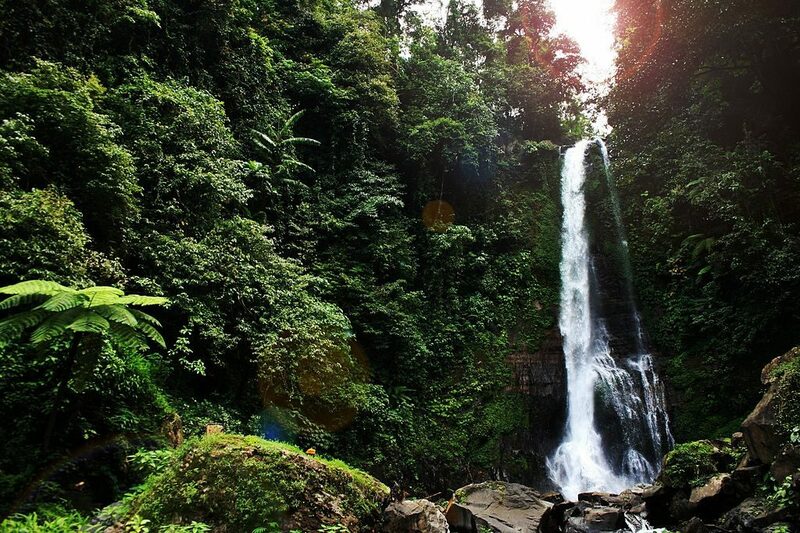 It’s recommended to visit Sekumpul, AlingAling and NungNung waterfall on the same day. Kanto Lampo is one of the most mystical waterfalls you will ever see. Head there during the early hours of the day, and, due to the positioning of the waterfall, the rays of sunlight filtering through the trees and hitting the waters is something of magic. Rather than one massive waterfall, it’s split into a few columns that cascade artistically over foundations of rock. It’s located 12km outside of Ubud, and in actual fact is a man-made structure that was official in 2015. You can climb up the waterfall to the rocks and feel the gentle flow of the water on your back. Swim in the shallow plunge pool and feel your muscles relax from the cool ebbing flow of the water. Work up an appetite, and then head back up to the top to purchase some street food on your way to the next destination. This is the primate waterfall destination for those who are not keen on strenuous hiking before reaching the waterfall. This is an easy walk from the carpark. Access: From Ubud, it is an easy 30-minute drive. Once you park the car, the walk to the waterfall is an easy 5-minutes. An absolute stunner that is actually so well-hidden, its difficult to get to if you don’t have a guide, so we recommend you hiring one, as this destination is so perfect it deserves to be visited. The ‘twin’ aspect of this waterfall is the two columns of water flowing down the steep cliffs to the turquoise blue pool below. The stunning, untouched greenery surrounding this stunner just adds to the surreal glamour of it, and the mountainous landscape will make you feel like you’re in anther world altogether. The trek is arduous, but that keeps away the crowds, and in the end, take a refreshing dip in the plunge pool, soak in the cool water, remind yourself that there are big things in the world just waiting to be explored (like this beauty!) and just be in the presence of Mother Nature at its finest. Access: We recommend you book a tour, as it is quite difficult to get there. 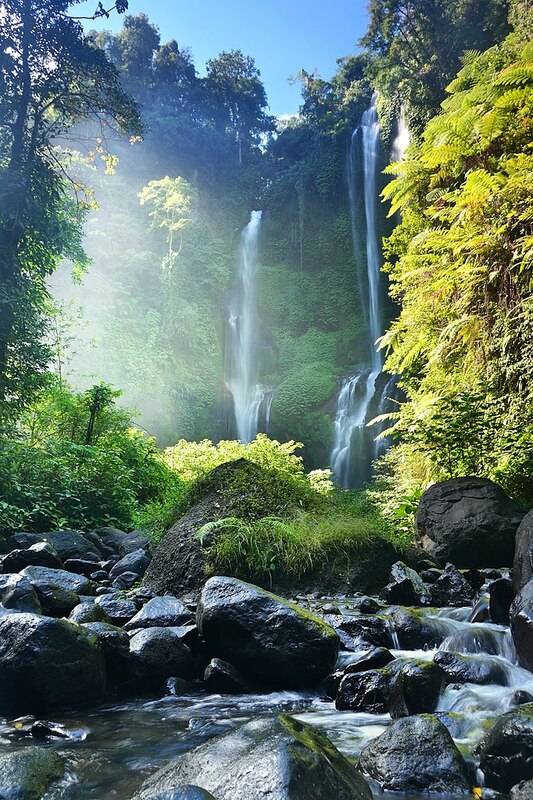 Rated as one of the best waterfall’s in Bali, Nung-Nung is a mammoth of a waterfall, located high in the mountains of Bali. The crisp forest air, refreshing cool water plunge pool, and surrounding trees make it the ultimate destination for out-of-this-world pictures and just an all-round great time swimming, floating, and enjoying the waters.The drive there passes by palm tree roads which make for an absolute scenic roadtrip. The waterfall route perfectly caters for couples, groups of friends, and families with young ones – just be mindful of the steps that you’ll need to take there and back (509 to be exact). Due to its unmatched beauty, it’s also a popular spot with the locals, so don’t be surprise if there are already people there when you arrive (especially if you come in the middle of the day). If you’re after some alone time, try to get there in the early hours of the morning. Access: From Ubud, it takes around 90-minute to drive there. To reach Sekumpul is a challenging hike that’s well-worth it in the end. Imagine tall cliffs splashing streams of water down its edges, flowing over massive rock formations and surrounded by luscious greenery that you forget is a distinct form of Bali when you’ve spent all your days at the beach clubs and resorts. When visiting this waterfall, know that where you see the grand water flow is actually an accumulation of seven different waterfalls located in different areas, at varying heights, all ‘gathering’ together at one point to produce this spectacle. Whilst it is quite known by locals and foreigners, due to its relative inaccessibility (it’s an hour from the city centre of Munduk), not many people venture to this destination, so if you’re game to traverse up and down and across many slippery steps and across raid rivers, reaching this gorgeous natural landmark at the end and stripping down to your bathers for a nice, cool swim with definitely be worth it – let’s not even talk about the amazing shots you’ll get that’ll warrant some major Instagram-envy from your friends back at home. Access: To get to Sekumpul, you will need to drive 1-hour out from Munduk. From there you will be able to hike down to Sekumpul waterfall, which will take in excess of 45-minutes. If you are driving, head to the Sekumpul Waterfall Parking Lot here. It’s a long and not-so-easy ride so you can also book a tour to go to Sekumpul waterfall. 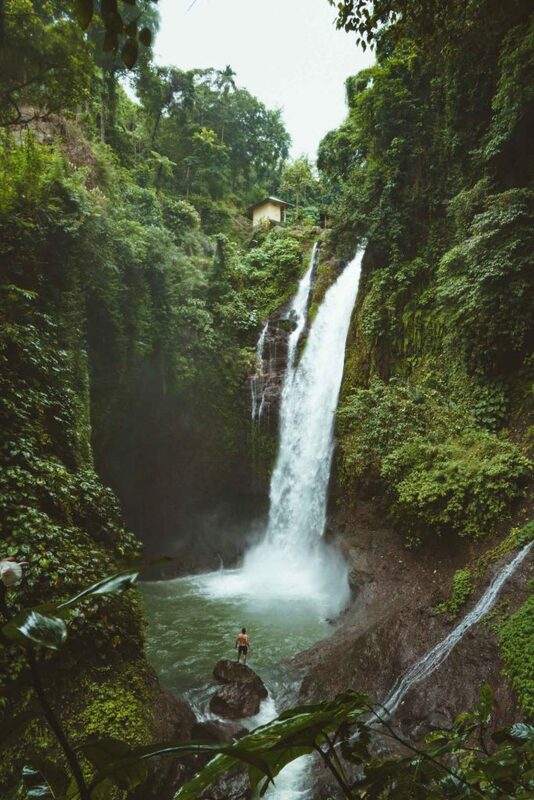 Munduk waterfall is what your waterfall dreams are made of. It’s so breathtaking that people even compare it to the waterfalls in movies. Nestled deep in the rainforest around Munduk Village, it’s a 15m, jaw-dropping spectacle that’s surrounded by equally stunning twin lakes, clove plantations, rice fields and mountains. Grab some food at the restaurant located at the waterfall before you journey further for 1km to encounter Melanting waterfall, the sister of Munduk. Access: This waterfall is located just a 15-minute drive from the Banyumala Twin Waterfall, so it is recommended to combine the two in one day. When being as close to a vast waterfall like GitGit, it’s very easy to be forgotten on the account that GitGit is the taller, more popular, and the one that’s much easier to get to, but that doesn’t mean Jembong is without its charms. Rather, because of this, visit Jembong and you might have the entire place to yourself (on a good day!). 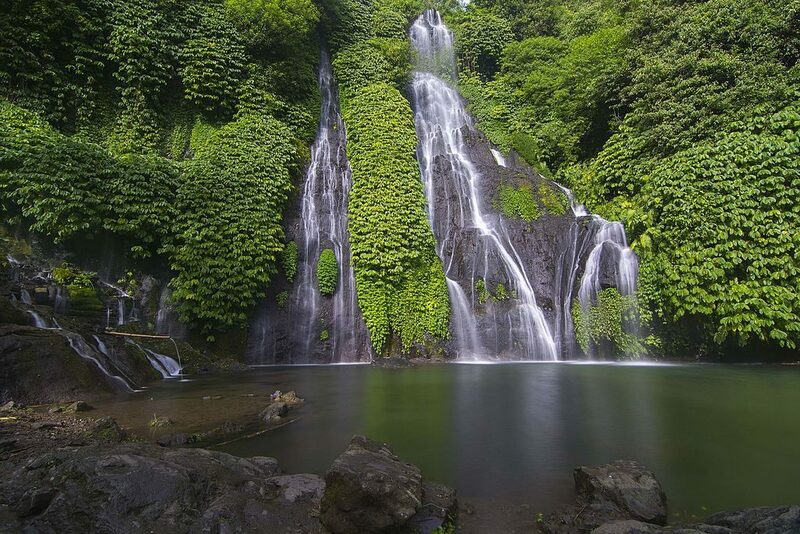 It’s also known locally as one of the better waterfalls in Bali. As opposed to most of the above waterfalls, which originate from tall cliffs and splash into a deep pool of water, Jembong is a wide cascade of water that is not too tall, meaning you can safely sit in the middle of the waterfall and enjoy the (somewhat) gentle flow of the water. It’s relaxing and quite therapeutic in a sense. This is the perfect one to visit if you’re not the cliff-jumping/rock diving type. Access: Heading there from Denpasar takes about 2.5 hours. Simply travel towards the Singaraja regency, and head past Git Git Waterfall. 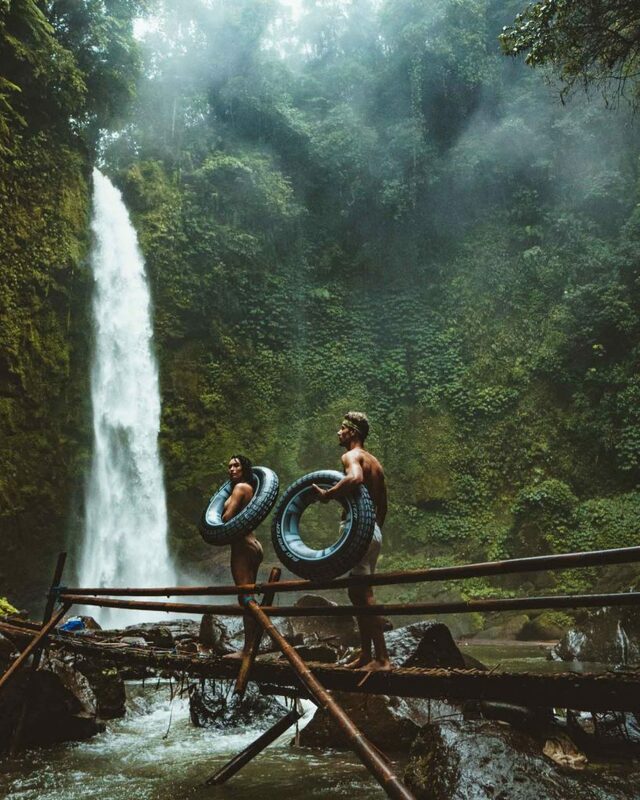 All the most wonderful views of waterfalls in Bali are a trek or two away, but its well worth the effort to experience some of Mother Nature’s finest forms. Pack your swimmers, bring a lens cloth, work up a sweat, and think about how basking in the sweet, cool water of any of these falls will wash away all of your problems.